The Premium+ consists of all features of the Premium with more benefits, you can include all your branches in your entry, plus your Mobile App presence is more extensive than the Premium package. 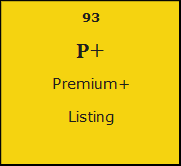 With the Premium+, you can include your Social Media links, Coupons, products and services. With the Premium+, you can list your business under 1 main category, 4 subcategories with Unlimited keywords and unlimited sub sub categories with unlimited keywords.